The service advisory boards will advise on how to manage specific enterprise services. For example, the Banner Coordinating Group, which is comprised of staff from Banner-using units across campus, advises IS staff on running the university's ERP; the Drupal Steering Committee advises on the current state and future development of the Drupal Web Hosting service. Some service advisory boards already exist and others will need to be created. In addition, two existing groups will continue serving an IT governance role. The Banner Coordinating Group will now serve as the service advisory board for Banner, and Corrie Bozung (IS) will continue to chair that group. The Integrated Data and Reporting (IDR) steering committee will also continue its work under the leadership of Stuart Laing and Renee Dorjahn. Additional service advisory boards will be formed in the future, both by Information Services and by UO Libraries. The domain subcommittees represent conceptual subsets of business, research, and teaching technologies. These subcommittees will take recommendations and advice from applicable service advisory boards. For example, an Administrative Technologies domain subcommittee will address issues related to Banner, constituent relationship management (CRM) software, DuckDocs, and other applications that are used for key business processes. An Information Security domain subcommittee will address questions about security and information assurance. On policies, the ITSC evaluates and provides recommendations on IT-related policies, including the creation of new and the revision of existing policy. 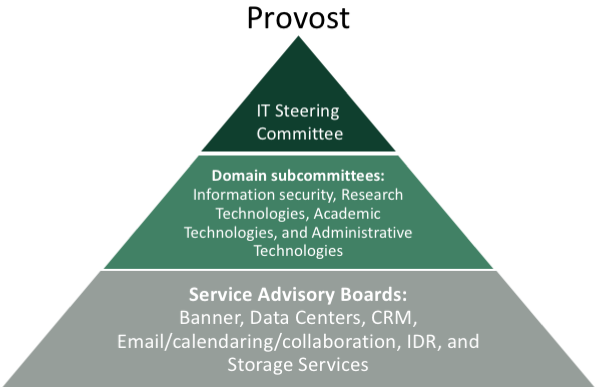 On priorities, the ITSC reviews proposals for IT resources, initiatives, services, and major enhancements that meet specified criteria and provides recommendations for prioritization in alignment with the University's strategies. On performance, the ITSC provides input on the efficacy of the UO IT Strategic Plan as needed, and participate in the development of future plans. ITSC meetings are held quarterly. These discussions informed a draft governance structure, which the IT Steering Committee (the university's top-level IT governance group) endorsed in late September, 2017. This governance structure and its goals are presented below. 1: Carraway, D., Arruda, K., Hagins, J., Martinez, B. R., Molina, H., Perry, J. D., II, . . . Will, C. C. (2017, March). Higher Education IT Governance Checklist. Retrieved from Higher Education IT Governance Checklist.